Dr. Philip Young is an award winning, Double board certified published author and facial plastic surgeon. He is an expert in this area of co2 laser surgery | resurfacing treatment and is board certified by the American Board of Laser Surgery. Discover why people from all around the world travel to see Dr. Young here: Top Ten Reasons to choose Dr. Philip Young. What makes us even more unique is Dr. Young’s groundbreaking Theory on Facial Beauty called the Circles of Prominence. Below is our page that was designed to help you with the aftercare for your CO2 Laser Resurfacing Procedure. During this discussion if you ever have any questions you can call us at (425.990.3223), or email us anytime. We try to respond within the first day and we are constantly checking our emails throughout the day. You will be prescribed the following medication or other medicines, based on your needs: Tretinoin (RetinA / retinol complex), Hydroquinone (epiquin), Tylenol #3, Keflex or Clindamycin, and Valtrex or Acyclovir. Be prepared for crustiness, peeling and itching for several days after the procedures. Day by day improvement is exciting, but the first 4-5 days can be challenging. If needed, keep the area cool with cold compresses. Avoid direct sunlight walking to your car. Turn on the air conditioner and aim it at your treated area for the ride home. If you wear glasses, place a piece of gauze between the bridge of your nose and glasses to avoid irritation. You should never remove the crusts by peeling them off. They should fall off naturally with your constant cleansing of your skin as described below. Pain Medications: If prescribed, you can start taking your pain medication, but do not take so much as to make you drowsy. Keep your pain level around 3-4 on a scale of 10, where 10 is the worst pain that you have ever experienced in your life and 0 is no pain. You should not have your pain at level 0. This could be a dangerous amount of pain medication that you are using to keep your pain at this level. Precautions for co2 Laser Resufacing: You can shower but never let the water directly hit the areas that were exposed to the laser and should avoid hot temperatures, keep it lukewarm for the first 2 weeks. For eating you should avoid hot (temperature) and spicy foods and keep everything bland in your diet for the first 2 weeks. 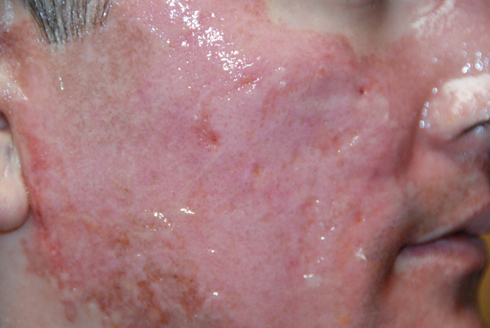 Laser Resurfacing Healing Photos: To give you another example of someone who underwent active and Deep fx (together it is referred to as total fx). The picture below is someone who underwent deep fx. This the usage of the co2 laser in a mode where the columns of energy and light are thinner but they penetrate deeper to cause more tissue tightening. Notice the white dots in a square pattern and they are separated by healthy non treated tissue, ie fractionated treatment. 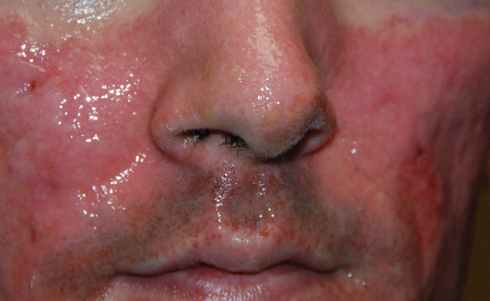 Active Fx Photos: This is the same patient but with the addition of active fx. Note that the white spots are wider in diameter and there is more char noted that is white in color. Now after the active fx, the deep fx dots are hard to see because the active fx has covered and camouflaged the deep fx dots. Also notice that the dots with active fx are separated by non treated tissue, i.e. also fractionated. When you do max fx, the dots are completely covering the tissue and this become more traditional resurfacing. Day After Photos of Total Fx (Active with Deep Fx): This is the same person the day after. Notice that there is really no crusting and oozing as much as the person that underwent max fx. 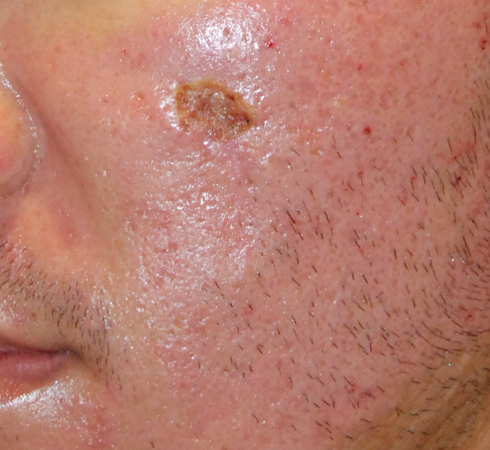 See this Photo Diary of Traditional cO2 Laser Resurfacing. This is the day after total fx. This person could clean a little more to see if there is raw pink skin underneath. The likelihood is that the total fx was not deep enough and hence not a lot of oozing or raw skin was produced. Co2 Laser Resurfacing Cleaning Instructions: Wash your face every hour or more if you have more crusting, by lathering your hands with Cetaphil or SkinMedica Sensitive cleanser. Pat the soap on your face without any rubbing. Rinse off gently with water. Rinse with a wash of 1-3 teaspoons of vinegar in 1 quart of water (preferred distilled water). Do this rinse every hour or more if you have more crusting. As you wash, the crusts become more hydrated and are more likely to fall off. Crusting can cause infections and scarring so it is important to hydrate them so they can fall off. Apply a light coat of Vaseline to cover the treated areas for 1-2 weeks until your skin has healed over and the peeling has finished. Never take off the peeling skin; it should fall off on its own. You can shower the day after but do not let the shower water directly hit your face because it can lead to the skin being peeled off forcefully and cause scarring. If you experience little to no crusting, you can cut cleaning down to every 2-3 hours. Start taking your antibiotics and continue anti-viral medications until you finish them. Do not use any active or harsh products for at least 3 to 4 weeks after your treatment. 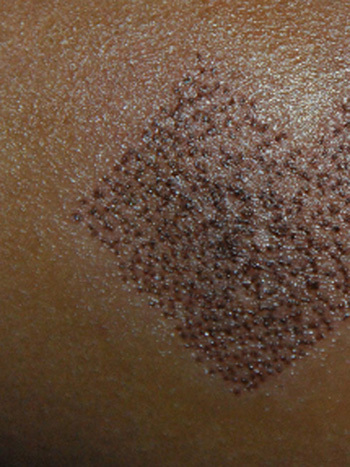 The surface skin is brand new and needs to normalize. We will have you come to our office for us to check on you the very next day after your procedure, day 6, 2 weeks, 4 weeks, 3 months, 6 months and then one year. Wash your face as above using gentle cleanser lather patted gently on the skin rinsing with cool water. Never rub or massage the treated area, as this could lead to scarring. Rinse with vinegar water solution to prevent infections and help healing. Apply Vaseline at all times for the first 1-2 weeks to help the skin heal. Place a towel over your pillow to protect from the Vaseline (occlusive ointment). Sleep on your back with your head slightly elevated; continue this every night until swelling subsides. If you experience eye irritation, use eye lubricant, such as Systane or Lacrilube before you go to sleep at night. You can also apply artificial tears every 30-60 minutes during the healing process for eye irritation. Continue washing your face every hour and more if you have more crusting with gentle cleanser lather patted gently on the skin rinsing with cool water. Never rub or massage the treated area, as this could lead to scarring. After cleansing apply the vinegar disinfectant solution.You can take a lukewarm shower and wash your hair, but do not let the water hit your treated area, which could force off the skin and lead to scarring. Do not remove the flaking, peeling skin. You should allow the cleansing and the vinegar and water rinses gently remove the skin. Re-apply a light coat of Vaseline to the treated area after each cleaning. Avoid alcohol and exercising until your face is healed. You should avoid sun exposure as much as you can for the first 6 months. Laser Resurfacing Max Fx and Dermabrasion Healing Photo: Here is a picture of one of our patients the day after the laser resurfacing using Max fx and dermabrasion concentrated on the cheeks. Max fx is the use of active fx as you will see below but with no intervening tissue that is left untreated. 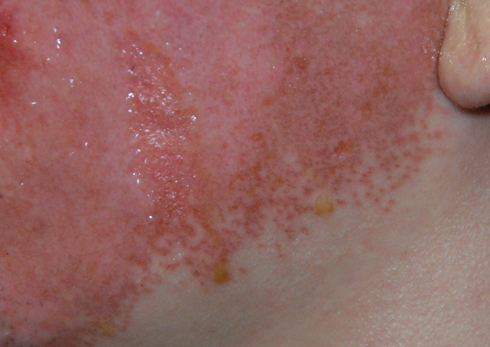 The density of the spots are more dense and completely covering the tissue or the spot treated. There is no signifcant oozing and crusting at this point. So this person is doing a great job of cleaning and rinsing at this point. Here is another person that underwent the same procedure as the person above. But notice a little crusting and oozing occuring in the angle of the jaw nearer to the bottom right of the picture. It looks yellow and honey like. You don’t want this and ou really want the skin to look pink and raw. This can be accomplished with regular cleansing and soaking with the rinses. But never forcefully remove the crusts, let them get hydrated from the rinsing and with this the crusting and oozing will gently come off. 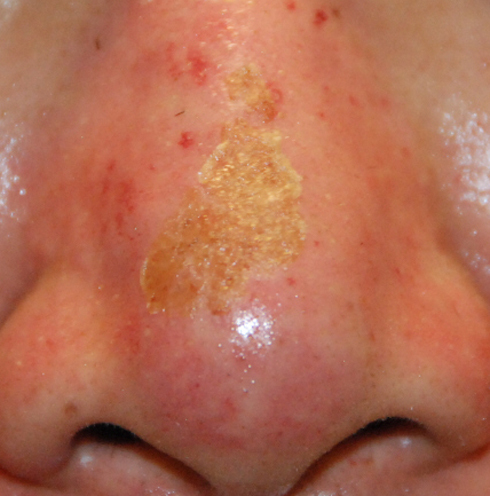 Max Fx / Dermaabrasion: Below is another pictures of another patient after the same type of treatment. Everything looks the way it should except on the tip of the nose there is a little oozing starting. You want to keep cleaning so the skin stays pink and raw as we discussed above. Continue washing your face up to 4 times a day (and more if you have more crusting) and rinsing with the vinegar water solution to prevent infections and help healing. Apply Vaseline at all times for the first 2 weeks to help the skin heal. Itching, particularly along the jaw-line, tends to begin on this day. Over the Counter 1% Hydrocortisone can help with the itching but you should inform the Doctor if this is excessive. Oral Benadryl may reduce itching. Avoid picking or scratching, which could lead to scarring. Continue washing your face up to 4 times a day and more if you have more crusting and rinsing with vinegar water, and applying Vaseline. Itching may persist. The central area of the face may begin exfoliating today, leaving behind soft pink tissue. But this exfoliation could occur later in the week. By this time, the itching has usually subsided. Continue your cleaning regime and continue applying the light coat of Vaseline. Here are some more pictures to help you with your cleaning. Below shows a picture of a person’s nose 6-7 days after laser resurfacing (max fx) and dermabrasion of one of our patients. The crusting in the middle part of the nose should not be there. The skin should appear pink like the surrounding areas around that central crust that you see. In this state, you should continue to clean with the gentle cleanser and rinse with the vinegar and water rinses until the crust gently falls away with the cleaning and rinsing. Sometimes the interval should be every 1-2 hours until it gets pink and then you taper off to 2-3 for a day then 3-4, etc. Here is another picture of a person 6 days after laser resurfacing (max fx) and dermbrasion with crusting that should be better cleaned. The frequency by which you clean will help soften the crusting and allow it to fall away from the skin and reveal the raw pink skin from the laser resurfacing. You can begin to transition from Vaseline to a non-occlusive gentle moisturizer but check with Dr Young before doing this. Dr. Young will usually have you come back at day 6-7. If you are ever unsure about your products, you can call the office to discuss your options. If the treated area is healed, then you can start your regular skin care program but check with Dr. Young first, provided you do NOT use harsh, active, acidic products for up to 4 weeks after your treatment (do not use Prevage, RetinA, hydroquinone, the TNS skin medica system, etc.). You can use hydrocortisone for itching and more significant redness etc. Persistent itching should be something that you call us to let us know. After 4 weeks, check with Dr. Young to see if you can re-start the Tretinoin and Hydroquinone. At this time, you can start applying a non-irritating sunscreen with titanium dioxide or parsol 1789 and apply mineral makeup to protect treated areas. Avoid excessive sun exposure for the first 6 weeks – although avoiding sun for 6 months would be better, if possible. Hat and clothing can help protect treated areas. Slowly start your exercise program. Continue to cleanse the skin gently with a Sensitive Skin Cleanser. Gently pat skin dry, never rub. Apply your gentle moisturizer (Skin Medica is the brand that we use) to entire face, day and night after cleansing. Every morning after applying Dermal Repair Cream, follow with Environmental Defense Sunscreen to protect the skin from damaging UVB and UVA sun rays. What Dr Young usually suggests is at 4 weeks you can do test spots with the Retin A (or Adapalene), Hydroquinone to see if you develop a big reaction such as excessive redness, tenderness. The test spot will let you know if you can start using these products over your whole face at the 4 week point. If there is no reaction you may start applying the topical medications as directed. If there is a reaction discontinue and try another test spot in one week. Call Dr. Young at 425.990.3223, if you have any questions.